Staggering into a sandy parking lot in the 40 degree heat, a herd of skirted cab drivers swarm in my direction at Yangon Airport. My driver (I choose at random) chews vigorously at a piece of neon gum and we become pals after he learns that my birthplace is near the home of his favourite football team. He teaches me Burmese on the road to Yangon. stalls spilling so chaotically into the road that my driver almost runs over a small girl turning the bend. He barely registers surprise and laughs offhandedly as the girl’s parents strike death glares into the wing mirror. The only noticeably absent element of this Southeast Asian scene are the motorbikes, as my aloof driver points out that they’re banned in Yangon, which in retrospect is probably a good thing. The first words I learn are thank you (it sounds a bit like “jazzy bear”), and then my Burmese lesson comes to an end as the driver pulls up in central Yangon and it is time to get out. “Mingalaba. 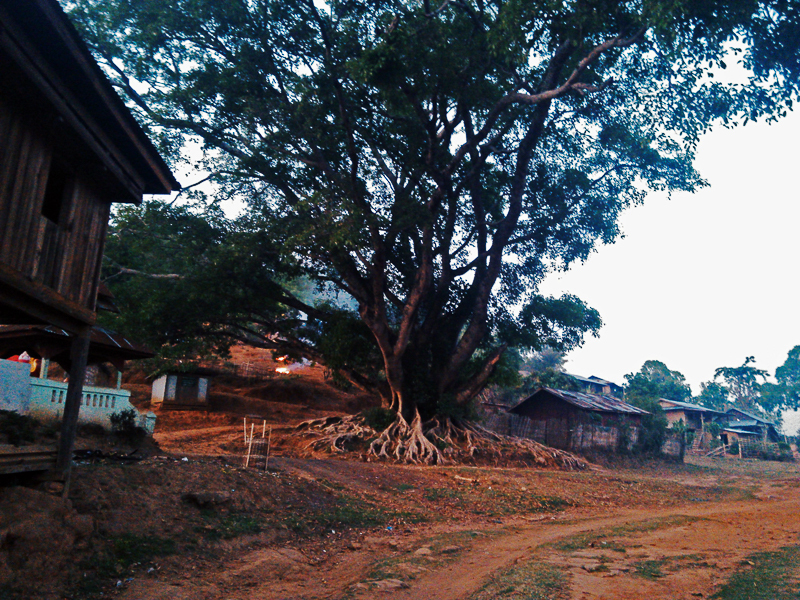 One-way ticket to Hsipaw, please”. I am now that person who only knows three words of the local language. To my relief, the ticket officer understands me. In fact he is beaming. He has all his mates with him in the tiny ticket booth and they’re all pissed on whiskey. As the officer writes out my ticket in dizzy loops of Burmese script, his friend pours us shots of Black Label and slides them through the bars one by one saying with a toothless grin he could barely contain, “Happy New Year”. A motorbike comes puttering over the hill and down the orange dirt track. The driver straddles bags overburdened with candy and other luxuries from the town we had spent the entire day trekking away from. A few village kids stop their game just to watch and giggle as he makes strenuous efforts to balance on the bike. I hear the rhythmic thudding of our host chopping vegetables in the kitchen. I see a woman laying out humble offerings beside the temple; a mother drying leaves of black tea. A kid drives a buffalo uphill with a sharp stick, peering back at the motorcyclist, who by now is struggling so much he has decided to get off and stagger down the hill with his load. Every now and then the boy prods the buffalo hard in the backside and the beast gives an impatient flick with his hind leg as he hurls forward in a flurry of hoofs. Out of nowhere, a jet plane roars across a darkening sky and our trekking guide JoJo mutters, “bad sign” as the noise subsides, “it means there is fighting in the north against China”. Across his face a smile illuminates as if on cue, and 67-year-old JoJo makes an announcement: “now, we do story time”. We gather round as kids do round a campfire. Savouring the spotlight, JoJo carefully removes a London cigarette from his pocket and feeds it with a lighter: “Good for the lung heh heh”. This is the sound of JoJo half-choking on smoke. He now passes round rice wine in an ancient plastic bottle, and launches into the story of the Austrian princess who once lived in Hsipaw and wrote a book (Twilight Over Burma: My Life as a Shan Princess) about her life and hardships suffered under the military rule. 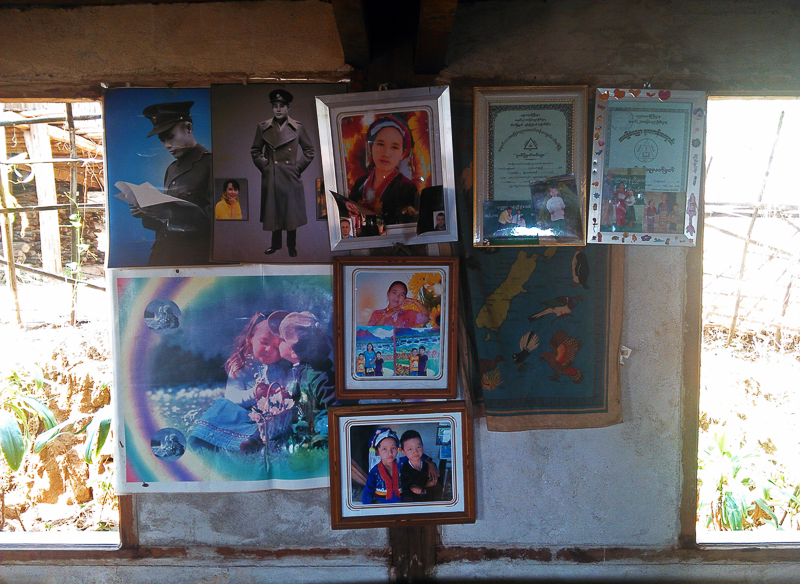 He shows laminated family photos – where in each frame, JoJo and his family members appear with the same expressionless face and when asked why he says “ah it is in ‘the Burmese way not to smile in photographs”. In one of the photos, he points to a shadowy, nebulous form lurking in the background and says, “I am glad I am not like my uncle, he had 41 wives and 160 children”. It is not too surprising that many of JoJo’s stories allude to his bitterness against China. All over Myanmar you bear witness to China’s muddy footprints; China turning communities upside down in order to build pipelines that will pump natural gas to the Middle Kingdom, the truckloads of wild cats that are smuggled over the border to be killed, declawed, and dismembered in the name of Chinese medicine. On the other hand, JoJo praises Chinese medicine for curing his hip injury when he fell off a ladder some years ago. JoJo takes great pride in conducting these tours, because he wants the western world to know about Burma and what the nation has been through. He is determined not to let it remain in China’s expanding shadow, neglected and ignored. It is late at night when I am swept off the pavement by three Muslim aunties who invite me into their home for cake with their huge extended family. A baker on a bike turns up close to midnight with the white box full of iced green cakes. The family are genuinely delighted to have a foreigner in their home. 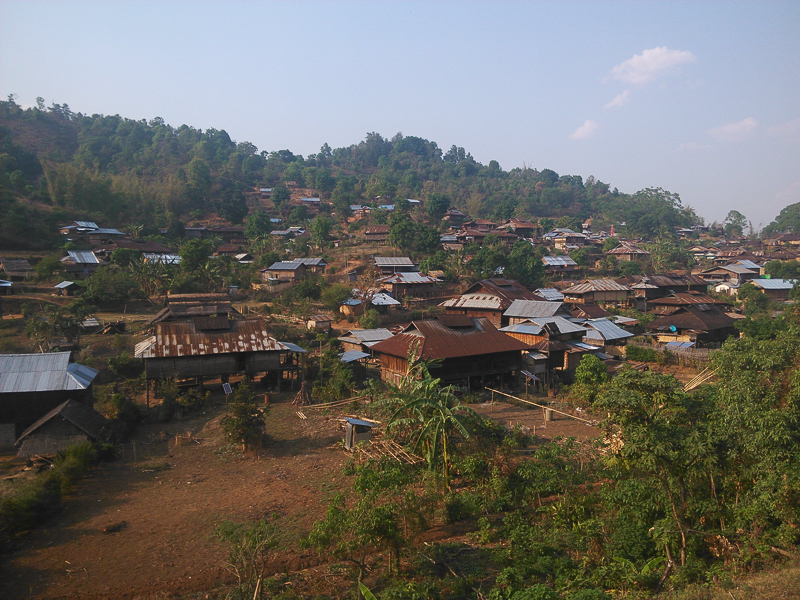 After four weeks of traveling around this country, I see Burma in its own entity. Burma: the sound of high-voltage mosquito bats clicking in the pitch-dark night; bus journeys with ten people simultaneously vomiting into tiny plastic bags as we dip into jungle valleys; girls folding heart-shaped betel leaves on the roadside; red-on-grey betel stained streets; tea shops crowded with cheroot-smoking men young and old sat on kid stools, chatting over the din of an old stereo oozing heavy rock; riverside towns with no electricity where candles glow from within musical huts; burning hillsides; the muscovado-sweet smell of chrysanthemums and gasoline; a lone motorcyclist rocketing into the night; sipping a 10p Birdy coffee over the rail tracks; Shan tea from a flowery glass in the mountains; boys playing sepak takraw with a bamboo ball in the early evening light; the thanaka-patterned faces smiling at open doors. Eva Clifford is a writer and aspiring photojournalist from the UK. She left England two years ago and has since lived in Laos, worked a year in Shanghai and is now based in London. See her photography at evaclifford.com or follow her Instagram account @evamarcelle.